It’s a message that has been passed from generations to generations as our parents took great care of us when we were kids and now also as we become parents to their grandchildren. It’s a never ending process and as they say, “A healthy mind stays inside a healthy body only” and to achieve healthy body we continue to strive not for ourselves but for everyone around us. Our kids are those special angels which brings a lot of joys and happiness to our family. We do everything in our capacity to take good care of these angels. We always take precautions to save them from any discomfort that they might face due to weather changes and any form of viral/sickness. My daughter is my angel and I really want the best for her. During those times when immunization injections are done to her, it’s a great pain to her but we know it’s only for the benefit of the kid. My mother took great care of us and gave us all the right stuff to eat. During our times, pizzas / burgers were not in the market but these days, kids are exposed to a lot of unhealthy food which can make them sick. And once a child is sick, the whole family is exposed to some stressful time. Kids get cranky as they face some unbearable pain which their bodies can’t take and as they suffer every parents & grandparents suffer too. It’s not wrong to say that “A healthy child makes a happy home” as there are several incidents from our own lives when will remind us of those times which we never want to face again. Food and drinks are the only inputs we give to our bodies and a good balanced diet full of fruits and vegetables builds our immune system and keeps us free from any kind of sickness. Sometimes when we are not able to control our diets due to travel and other commitments, we need to take some extra nutrition in the form of Chyawanprash and dry fruits. Same need to be given to kids as per their body requirements based on age and to build their immune system. Kids generally are always busy in their play and keeps running away from food and it’s a duty of parents to catch hold of them and give them regular nutritious food and necessary vitamins. My daughter needs to be brought back to home to have a glass of milk with almonds and some Chyawanprash in winters to keep her strong and fit. 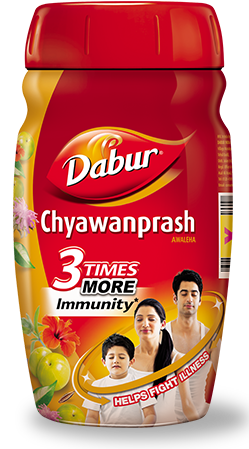 She really loves Dabur Chyawanprash and eats a spoon of it every morning and evening by herself. This habit has definitely kept her strong during these winters and will continue to till the time she follows the same. If she is happy, we will be happy and if we all are happy, we make a great home which builds our life and happiness.